In Eastern culture, the concept of the coexistence of the feminine and masculine within the divine is commonly accepted. But in the West, we have overemphasised the masculine in the divine – and we have seen many global tragedies as a result. Now, we are seeking to regain balance, as evidenced in the resurgent interest in the wisdom of the Goddess and ancient matriarchal religions. But, as Dr. Schaup's work explains, the Divine Feminine has been with us all along, hidden in ancient Christian scripture, and taking many different forms and names in Eastern and Western culture alike. She is Sophia, or Divine Wisdom. Dr. Schaup heralds a paradigm shift in our concept of God with this provocative chronicle of the manifestation of the Divine Feminine throughout history and in the world's diverse cultures. By tracing Sophia's presence, Dr. Schaup's work does not simply advocate a return to matriarchal worship, but serves as a beacon in the quest of our time to overcome alienation between human and nature, man and woman, human and God. Dr. Schaup explores Lady Wisdom in Biblical Scripture, Sophia in the Old Testament, Lilith and Sophia's counterparts in the Andean, Hindu, and Chinese religions. Examining the patriarchal dilemma, Dr. Schaup brings to light the work of Christian mystics such as Hildegard of Bingen, Jacob Boehme and the Russian Sophiologists. She places emphasis on the work of Otfried Eberz, a contemporary Sophiologist who makes a radical appeal to modern women to reclaim the consciousness of the Goddess. 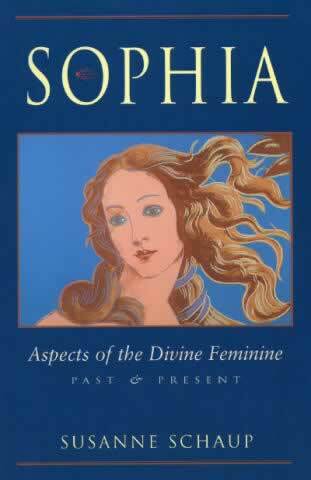 Dr. Schaup shows Sophia to be a universal figure, representing wisdom, femininity, motherhood, and sexuality. She writes especially for women coming from a Christian background who are interested in expanding their quest for spiritual wholeness. Knowledge for its own sake cannot bring meaning into our lives, but knowledge tempered by love, alignment with divine will imparts true wisdom, which is manifest in the appearance of Sophia. Sophia's story is an exciting one that shows the common thread of the religious urge in individuals the world over. With this beautifully written book, Dr. Schaup teaches us to recognize Sophia and Her relevance to our time so that we can restore Her to Her rightful place in our hearts and minds, alongside the "Fathergod" and gain a new sense of wholeness.